The library is offering two workshops on the bibliography software Zotero in February, one in person and one online. 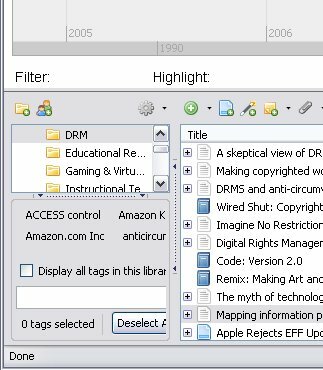 Zotero is a Firefox plugin that makes it easy to save citations and automatically create bibliographies in Word. It’s like having EndNote running inside your browser! It’s easy to use and free. For more information about Zotero, see our Zotero guide or the Zotero home page. Wed, Feb 10, 2010: Classroom 1 (next to Saxby’s coffee shop), Library North, 10-11am. Registration encouraged but walk-ins welcome. Wed, Feb 24, 2010: Online via vClass, 10-11am. Registration is mandatory so that I can send a link to the vClass site, but “seating” is unlimited. System requirements: Firefox web browser. Any operating system. MS Word or OpenOffice optional. To sign up for either workshop, e-mail Jason Puckett at jpuckett@gsu.edu. I can also teach Zotero workshops for your class or department upon request. This entry was posted in For Faculty, For Graduate Students, For Students, Instruction, Services, Software and tagged zotero. Bookmark the permalink. Are you guys recommending people move to Zotero…that is, will you still be supporting EndNote via workshops and Q & A? We’re definitely still supporting EndNote, Julie. Zotero’s another option (and my personal preference) but I know of no plans for GSU to drop the license or support for EndNote. are you available for an individual session on Zotaro? Yes, Millie. Email me and we’ll find a time to meet.